What Do PG&E's Bankruptcy Plans Mean for You? These are rocky times for Pacific Gas and Electric Co.
As its stock price tanked, the San Francisco-based utility on Monday announced its plans to file for bankruptcy by the end of January. In a move that comes just a day after the resignation of its chief executive, the company cited the billions of dollars in potential liability it faces for the role its equipment might have played in the devastating 2018 Camp Fire and 2017 North Bay fires. But as dire as it might seem when a company responsible for supplying gas and electricity to 16 million Californians goes into financial free fall, you probably don't need to get out your propane lanterns just yet. Here's a brief explainer on how PG&E's plan to file for Chapter 11 bankruptcy could affect you. Will my lights and heat stay on? It also said it was “committed to continuing to make investments in system safety as it works with regulators, policymakers and other key stakeholders." And although most utility watchdog groups are less than thrilled by PG&E's decision to file for bankruptcy, they generally agree that the company will continue to provide service. "Consumers should not be frightened when they hear that PG&E may decide to file for bankruptcy," said Mindy Spatt, a spokeswoman for The Utility Reform Network. "Their lights are not going to go out. The little blue trucks are not going to stop coming when something goes wrong." So ... what is Chapter 11 bankruptcy? First off, don't confuse it with Chapter 7 bankruptcy, in which a company's assets can be liquidated and sold off. Chapter 11 is generally a bit less dramatic in that it gives some breathing room to companies who can't pay their debts, placing them under the protection of a federal bankruptcy court. It allows companies to continue operating while they come up with a court-approved restructuring plan to reduce their debt obligations. This process can often take years. Earlier this month, the parent company of PG&E began exploring whether it could auction off its natural gas division and use those proceeds to help pay off creditors and wildfire claimants. The company also has a significant number of other assets it could sell off, including hydroelectric dams and even its San Francisco headquarters. Under a new California law, companies must give at least 15 days notice before filing, so PG&E will likely file for Chapter 11 by the end of January. "Part of what PG&E is doing right now is bargaining with the state of California," said Michael Wara, director of Stanford's Climate and Energy Policy Program. "The company has, according to these filings, enough cash to weather six months to a year operating. But PG&E is unhealthy. It is a sick company." Will this make my utility bill go up? It's unclear. The California Public Utilities Commission is the agency that must approve rate hikes, and weeks before filing for bankruptcy, PG&E already asked the agency for a 6.4 percent electrical rate hike starting in 2020. If that were approved, it would amount to an average ratepayer increase of about $10.50 per month. And that's before even considering the impact that bankruptcy could have. Rate increases will likely be tied to whatever reorganization plan a bankruptcy court judge approves. Bankruptcy proceedings can result in steep legal fees, and some consumer advocates are concerned those costs will inevitably be passed on to ratepayers. PG&E may also face fines or need to borrow money as part of its restructuring plan, all of which could increase costs that ratepayers may have to shoulder. Spatt, of The Utility Reform Network, said that if history is any guide, PG&E's bankruptcy filing will likely force consumers to pay more in the long run. She notes the last time the company filed for Chapter 11 bankruptcy, in 2001, it remained under U.S. Bankruptcy Court protection for three years. If you're a PG&E customer, you can still see that cost on your bill as the DWR Bond Charge. Loretta Lynch, former president of the California Public Utilities Commission, urged the agency to protect consumers. Last year, California legislators also passed a law allowing PG&E to issue bonds to help pay its liability costs, and that opens the door for the CPUC to decide whether those costs can be passed on to ratepayers. It's unclear how the law's provisions will apply to PG&E, especially since it was partially designed to prevent the utility from filing for bankruptcy. What does this mean for PG&E employees? 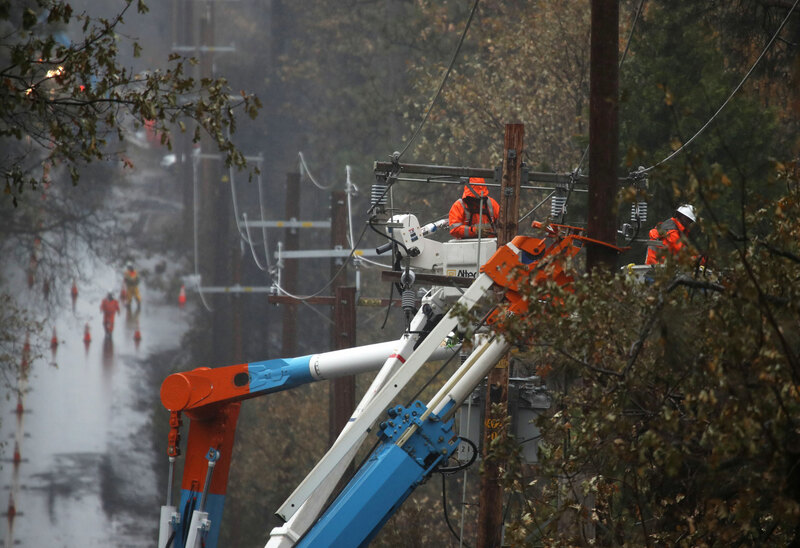 PG&E said it intends to continue paying and providing benefits to its roughly 20,000 workers. But if bankruptcy requires the company to significantly reduce its costs or shrink operations, that could lead to major layoffs or pension reductions. It could also use Chapter 11 to renegotiate worker contracts. Unions representing PG&E workers say they are keeping a close eye on what the utility’s plans will mean for members’ contracts and retirement plans. Tom Dalzell, a business manager with the International Brotherhood of Electrical Workers Local 1245, thinks it’s highly unlikely the contract would be nullified. "I think that the contract would be confirmed if they filed for bankruptcy," he said. Dalzell said he believes the extreme financial pressure PG&E faces makes it necessary. Among other uncertainties facing the company, PG&E said in Monday's SEC filing that it could be found in violation of its criminal probation imposed after a 2016 conviction for breaking federal pipeline safety laws leading to the deadly San Bruno gas explosion. 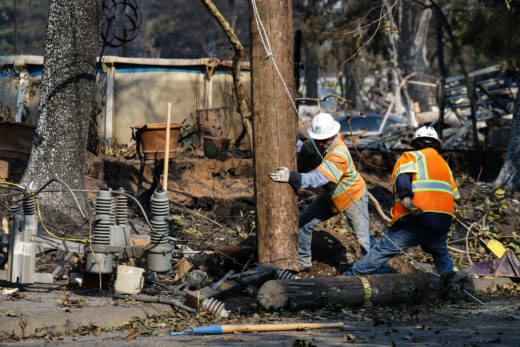 Earlier this month, U.S. District Judge William Alsup said PG&E should be required to "remove or trim all trees that could fall onto its power lines" and reinspect its grid. The judge gave the utility two weeks to respond and set a hearing for Jan. 30. How will this all impact wildfire survivors? But it's still unclear how much debt PG&E will actually have at the end of the day. The utility is bracing for hundreds of lawsuits filed on behalf of wildfire victims, who maintain that the worst of the 2017 and 2018 blazes were sparked by poorly maintained electrical lines. Those liabilities could exceed $30 billion. That’s on top of the roughly $18 billion the publicly traded company already owes its creditors. Bankruptcy filings allow PG&E to consolidate those cases, and it can force litigants to accept smaller settlements. If the company can’t pay up, the court will have to decide how much funding wildfire victims and will actually receive, and that could result in much less of a payout than survivors are asking for to rebuild their lives. “Fire victims will get cents on the dollar,” Stanford’s Michael Wara predicted. Meanwhile, state politicians are trying to reassure survivors. KQED's Michelle Wiley and Peter Jon Shuler contributed to this report.